click here to view it and for heavens sake YOUTH let's go vote! We, the youth of canada is 3 million strong. Let's scare the pants off of our government and turn up to vote! Some people keep saying, 'why would we vote? 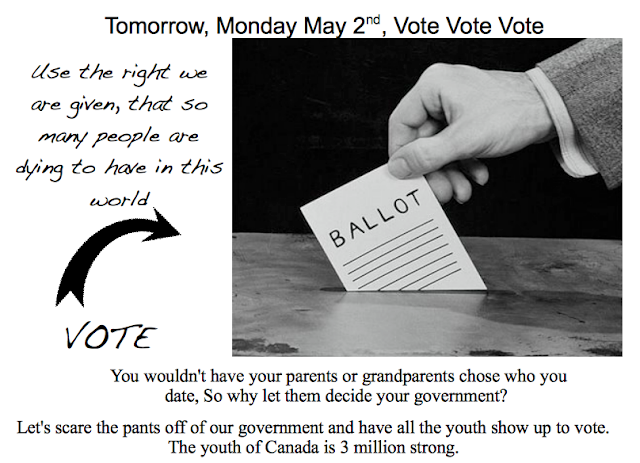 we'll vote when we're older...' but as another person said 'we wouldn't want our parents and grandparents to chose who we date...so why do we let them chose who our government is? '...we pay taxes, we use the transit systems, the roads and hwys, the hospitals, the education systems...so...makes sense to vote? and seriously check out the chart click here. it's SO easy to read.